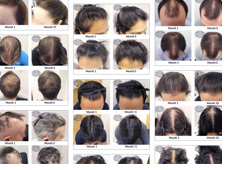 When people begin suffering from hair loss, they naturally seek to identify the cause of it within their own body. While many hair loss conditions are caused by genes and temporary conditions existing within the body, sometimes external environmental factors can play an important part in the causes of hair loss. Research carried out at the University of London in 2008 suggested that air pollution may play a larger role in hairloss than previously thought. Scientists at the University’s School of Medicine studied the hair follicles of balding men, and concluded that toxins and carcinogens in polluted air can interfere with the protein producing processes within the body which stimulate hair growth. As well as air pollution produced by traffic and other sources, environmental triggers for hair loss can also be found closer to home. Smoking has been linked to hair loss in a number of studies. In 2007, a study of over 700 Asian men, who are statistically less predisposed to baldness than Europeans, found that those who smoked on a regular basis suffered from significantly greater hairloss. They hypothesised that the reason smoking could cause hair loss may be because of the damage done by the smoke to the circulatory systems which feed blood and nutrients to the hair follicles. While it may be unfeasible to move to an area with less pollution simply for the sake of preventing further hair loss, this, and other research like it, suggests that those suffering from hair loss may be able to slow its advance by kicking the smoking habit. Chemicals which come into direct contact with the skin and hair have also been linked to damaged hair and potential hairloss. Chlorine found in swimming pools is one such chemical. While no direct link between regular exposure to chlorine and hair loss has been found, it has been shown to damage and discolour the hair, contributing to poor hair health which may exacerbate an existing hair loss condition. In private swimming pools owned by individuals the risk may be greater, as the amount of chlorine used to clean the pool is unregulated. Exposure to the sun, meanwhile, is not thought to cause hair loss, but prolonged exposure may damage the hair and make it more brittle. Sunburn occurring on the scalp, however, can trigger Telogen Effluvium, a temporary hair loss condition in which more follicles than usual enter the resting (telogen) phase of their growth cycle. People with closely shaved hair are more likely to experience this, as thicker hair acts as a shield against the sun, protecting the skin tissue and follicles beneath. 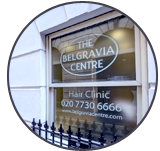 If you’re concerned about recent hair loss or wish to tackle a hair loss condition that has been persisting for some time, the Belgravia Centre can help. Our team of experienced hair loss specialists deal with a wide range of hair loss conditions on a daily basis, including male pattern baldness (Androgenetic Alopecia), Alopecia Areata and Telogen Effluvium. Two of our primary pharmaceutical methods of treating hair loss are finasteride 1mg (which people sometimes refer to by it’s first registered brand name Propecia although it is now available under a range of various brand names including Aindeem) and Minoxidil, which are the only scientifically proven hair loss treatments that are licensed by the MHRA and the FDA. 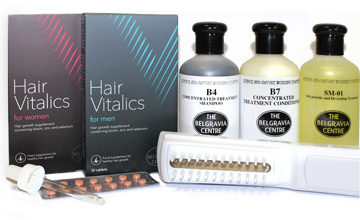 We use these treatments in combination with a range of our own hair growth boosters to nurse hair back to health, prevent further hair loss and promote re-growth. Most importantly, we closely monitor the situation to ensure that the underlying cause of the hair loss is dealt with.